U2 have topped the Billboard Dance Club Songs Chart with remixes of Love Is Bigger Than Anything In Its Way. New versions of track – the third single from current album Songs of Experience (Island) – by Beck, Cheat Codes, Will Clarke, The Funk Hunters and Daybreakers have seen the song take the #1 spot on the Billboard Dance Club Songs Chart. This is the fourth time the band have topped the chart, most recently with Beautiful Day (2001) as well as Discothèque (1997) and Lemon (1993). 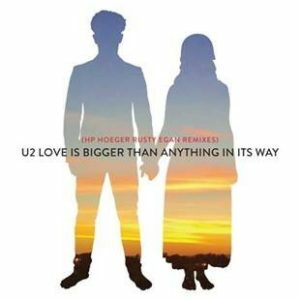 And today also sees the release of a three-track EP titled Love Is Bigger Than Anything In Its Way (HP Hoeger Rusty Egan Remixes). Listen HERE. To hear all remix versions of Love Is Bigger Than Anything In Its Way, listen here. U2’s groundbreaking eXPERIENCE + iNNOCENCE Tour hits Europe this Autumn, kicking off in Berlin on 31 August with dates in Manchester (19 & 20 October) and London (23 & 24 October), ahead of four hometown shows in Dublin.